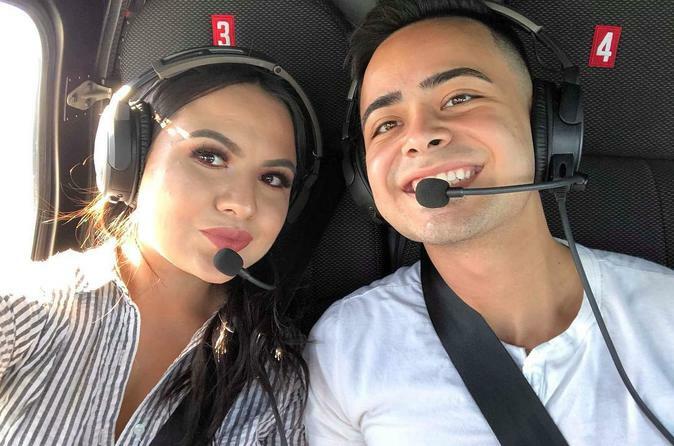 Celebrate a special occasion or enjoy a romantic night out with your partner on a helicopter tour with dinner included. Travel like a VIP in a luxurious helicopter and capture the views of the Chicago skyline from the most unique perspective. Recount the experience during your dinner at the Duck Inn Chicago in its pre-Prohibition era tavern with a cozy retro design aesthetic that makes it feel like home. Your night begins at Chicago's only private heliport located minutes from downtown in the historic Bridgeport neighborhood. Your helicopter awaits as you relax in the VIP lounge enjoying an optional champagne toast. There is an entertaining safety briefing prior to boarding the aircraft. The jet-powered aircraft ensures the smoothest ride along with the leather seats for comfort, floor to ceiling windows for optimal views, and noise canceling headsets to speak to your friends or pilot during the flight. The flight travels 24 miles with an experienced pilot as your guide telling stories about the city's not so known history. Rise above Chicago's magnificent skyline soaring close to the iconic skyscrapers like the Willis Tower, The John Hancock, Trump Tower, and the Aon Center. You'll capture the picturesque panoramas of the of the landmarks below jutting out over Lake Michigan. The breathtaking views will last a lifetime. Upon returning to the heliport a VIP shuttle will take you to your dinner for two at the Duck Inn. The Michelin rated Duck Inn is a local neighborhood gastro-tavern and dining room located in the Bridgeport neighborhood. You'll dine on the seasonal menu prepared by award-winning chef Kevin Hickey, paired with an exquisite cocktail selection and wine.